A Mass of Christian Burial for Sister Rosaria Raidl, D.C., was celebrated Feb. 5, 2016, at Seton Residence Chapel in Evansville, Ind. Burial followed at St. Joseph Cemetery in Evansville. Sister Rosaria died Feb. 1, 2016, in Evansville. She was 83 years of age and 63 years vocation as a Daughter of Charity of St. Vincent de Paul. Born in Mount Calm, Texas, Oct. 10, 1932, Sister Rosaria was one of six children born to Frank and Mary Julia (Pavlovsky) Raidl. She was baptized Lillian Marie. Sister graduated from Mart High School in Mart, Texas, in 1951, and she entered the Daughters of Charity in St. Louis in August of 1952. Sister Rosaria earned her certificate as a Registered Nurse from Hotel Dieu School of Nursing in New Orleans, La., in 1956. She completed her Bachelor of Science degree in nursing from Marillac College in St. Louis, Mo., in 1963. Sister also earned a Master of Science in adult nursing from Indiana University in Indianapolis, Ind., in 1980. After initial formation, Sister Rosaria served as a student nurse, staff nurse, and nurse supervisor at Hotel Dieu Hospital in New Orleans (1953 to 1960); nurse supervisor at Hotel Dieu Hospital in El Paso, Texas (1963 to 1967); nurse at St. Anne’s Home (for senior Sisters) in St. Louis (1967); nurse at Seton Residence (for senior Sisters) in Evansville (1968 to 1973); and nurse at Good Samaritan Hospital in Selma, Ala. (1973 to 1977). Sister Rosaria served in parish ministry at Catholic Social Services in Walls, Miss. (1980 to 1992). She then ministered as a docent at the National Shrine of St. Elizabeth Ann Seton in Emmitsburg, Md. (1992 to 1993). 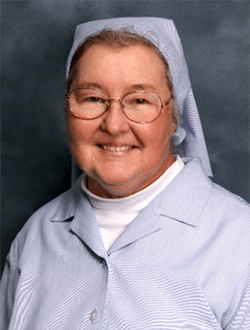 Sister next served as a community nurse at St. Vincent Hospital and Health Services in Indianapolis (1993 to 2014). Most recently, Sister Rosaria ministered as a volunteer at St. Vincent Center for Families and Children, and as spiritual advisor for the Society of St. Vincent DePaul and a member of the choir at Resurrection Parish, all in Evansville. Sister Rosaria was preceded in death by her parents. She is survived by her sisters: Frances LeGrande, Mary Rose Haferkamp, and Alaine Ann Winborne; her brothers: Frank Raidl and Edward Raidl; many nieces and nephews; many friends; and her Sisters in Community.